When life gets busy (or you just can’t be bothered to think too hard about what you’re going to wear), it’s nice to go back to basics with classic, no-fail pieces. I have a feeling that this flowy blouse & patterned shorts combination is going to be a uniform this summer, especially since I couldn’t think of a more comfortable outfit… and all it takes is a simple swap in accessories to create a look suitable for virtually any occasion. Have a great Monday, and to everyone who is enjoying a long weekend: I hope you’re having a restful day! really love the color and pattern combo!! i love ur shorts!! Agreed, classic pieces never fail. Love this chic look! You look effortlessly chic! Love love love your hair style! You look fantastic! I love those shorts! I am in love with your clutch, the perfect statement piece! The best looks are the ones you don’t have to think about. Beautiful color combo, Jen! Love the colors in this look! Beautiful, classy, and simple! I love those shorts. Leopard and red look so good together! The “back to basics” approach to dressing happens far too often for me. You look great here! Love your choice of basics; sadly, I can’t get away with shorts at my office. Love the print and bright red tee and how you mixed colors! FAB! So effortless Jen – one of my favourite looks of yours. I’ll all about classics and simplicity! Oh this is such an effortlessly chic look! I love your leopard printed shorts! Jen, I love this oh so much! 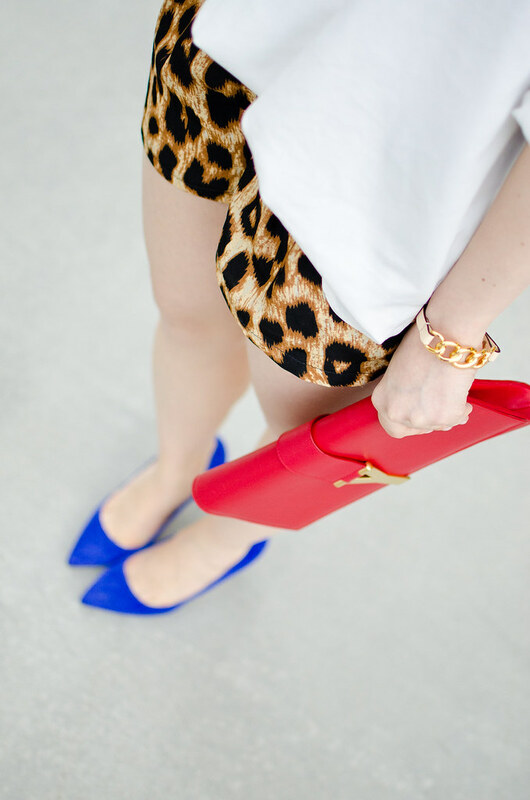 I love the bright primary colors (I’m pretty much dying over that clutch!) and the blouse and shorts look so supremely comfy & cute! Definitely summer uniform material! Love it! Super gorgeous and oh so chic! You really can’t go wrong with stylish basics like a blouse and printed shorts, and the pops of colour add just the right amount of fun. Love this look! The pop of blue is great! Loving the easy, chic and effortless look of the button down. Perfect for spring/summer. And the pop of color keeps it all fun. the colors in this ensemble are to die for, you look amazing!